Biomedical engineering student Alexandra LaLonde introduces fluid and electrical impulses onto a micro-device situated on a portable microscope. 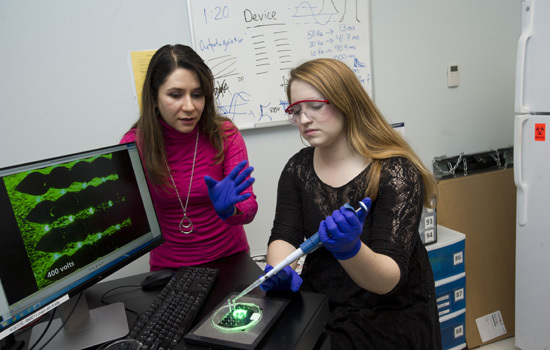 Under the guidance of professor Blanca Lapizco-Encinas, who finds great value in incorporating undergraduate students in research, the two are working together to develop microfluidic systems and techniques to separate, screen and analyze biological cells, as seen in the computer image. It’s uncommon for undergraduate students to be the first authors of a research paper accepted and published in a recognized, peer-reviewed journal. Alexandra LaLonde has had two—just this year. And the fourth-year biomedical engineering major co-authored two other articles since she started working in professor Blanca Lapizco-Encinas’ Microscale Bio-Separations Laboratory in 2013. LaLonde is part of a team developing techniques in microfluidics to separate live cells from dead cells so that scientists and clinicians can better analyze diseases. And once analyzed, intervention and cures are not too far behind. This is what a student-centered research university looks like under RIT’s new Strategic Plan as more undergraduates, like LaLonde, are immersed in lab experiences, collaborating with graduate students and post-doctoral scientists, and being mentored by faculty like Lapizco-Encinas. They are also contributing toward solving real-world problems as compelling as improving the future of health care. Today, work in the Bio-Separations Lab is about developing techniques to build lab-on-a-chip devices, highly sophisticated laboratories on microchips. These miniaturized devices have multiple channels where fluid samples containing mixtures with E.coli (bacterium) or S.cerevisiae (yeast), for example, are assessed. Once exposed to electrical currents, the bio-particles separate, making them easier to analyze. Challenges, however, are in the system design even as microfluidic technologies and miniaturizing complex lab functions continue to mature. Researchers are also trying to determine the threshold of electrical fields applied to adequately manipulate the fluids but also ensuring that live cells are not damaged. Some of those techniques were developed and tested by LaLonde, who was able to determine significant levels where the cells remain viable despite manipulation with high electric potentials. Imagine lab-on-a-chip capabilities at military installations to support injured combat troops, or to help rescue teams in natural disasters, or even in the case of the recent Ebola outbreak, to better support caregivers, she explained. An additional plus was working with third-year biomedical engineering student Maria Romero-Creel as a research partner, and following in Lapizco-Encinas footsteps as a mentor herself. “This was a unique experience because I was able to see someone else as enthusiastic about this as I was,” LaLonde said. With just one more year at RIT, LaLonde, a Syracuse, N.Y., native, intends to go into law after graduation and believes her experiences have given her an edge and a career focus. Lapizco-Encinas agreed. “Students have all these wonderful skills and capabilities, but they need to have the right environment to be successful. Our undergraduates have what they need to shine. I treat them like I treat any graduate or doctoral student because they are working to that level. They are all colleagues, with the same level of responsibility. I have had very rewarding experiences working and publishing several journal articles with undergraduate students as first authors. Editor’s Note: This story is the first in a continuing series that demonstrates RIT’s commitment to the new Strategic Plan. Web extra: To read RIT’s Strategic Plan, “Greatness Through Difference,” go to www.rit.edu/president/plan2025.